1977 was a transitional year for me. I sat my O-Levels in the summer, and moved into the sixth form in the autumn. Musically, as I have already hinted in this series, the established order was being challenged by a number of young 'upstarts', as punk and new wave music surged in popularity, but the old guard was not giving in without a fight. I have a strong recollection of that autumn of 1977, and of a sense of eager anticipation for the new album from ELO among some of my friends. 1976's 'A New World Record' had begun to cement the band's reputation as a kind of progressive pop rock band with classical overtones, and had brought them some minor success both in the singles and album chart. But in the punk autumn, this was a double album - 70 minutes of music - and side 3 was a single piece, albeit divided into 4 songs (or movements? ): the 'Concerto for a Rainy Day'. Were the dinosaurs dead, or was there still some fight left in them? There are 17 songs on the album: apart from 'Believe Me Now' - a mere 1:21 - all of them between 3:26 and 5:10. So none of the epic posturing that had so enraged the new wave (not that ELO had indulged in that since 'Kuiama' on their 1973 sophomore release). Lynne managed to spawn 4 Top 20 hit singles from this collection, and, unlike the rage and anarchy at the heart of much of the contemporary punk material, this is on the whole a very up-beat collection, though with light and shade. Jeff Lynne has, it's I think fair to say, always been greatly influenced by The Beatles in the music that he produces, and that influence (or certainly John Lennon's) is evident here, particularly on 'Starlight' and 'Stepping Out'. But there are echoes for me of Dylan in places in the vocals of 'Night in the City' (as well as The Who in the song too) and 'Sweet is the Night', and Bowie in places too. And was 'Jungle' an influence on Genesis for 'Congo'? There is also some interesting experimentation, particularly in the instrumental 'The Whale' on side 4. There are strong, powerful string arrangements throughout this collection, along with good vocal harmonies and Richard Tandy's quirky use of the Vocoder in a number of places. 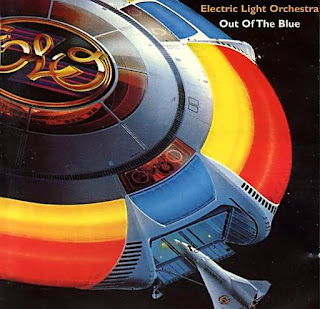 Jeff Lynne's skill at penning catchy, memorable songs is evident, and these factors combine to secure, I believe, the longevity and timelessness of the album. My lasting impression is of something of its time, yet timeless too - a neat trick if you can pull it off! But it's a great album to come back to.